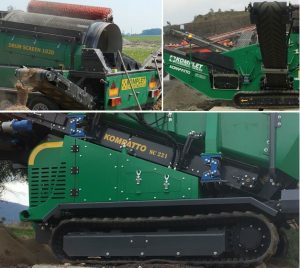 Komplet are pleased to announce that they will participate in this year’s Intermat Exhibition in Paris, to showcase three models from their mobile screening machines range, from 23 to 28 April 2018. This international trade show is held every three years and gathers over 180,000 professionals involved in the environment, demolition and recycling sectors, as well as other related domains. The event boasts over 1,500 exhibitors presenting machinery, equipment and materials solutions, and will take place in the Paris Nord Villepinte Exhibition Centre. Komplet screening equipment is compact, extremely versatile and allows to process any kind of material or waste. It is especially conceived for working in the toughest conditions, it is light and easy to operate, and offers a high-quality material treatment. Check our product pages for further details on functionalities and specifics and come pay us a visit to see these machines for yourself! Komplet will be waiting to meet you at stand 5A H134. The show times are 9.00am – 6.00pm every day. Here below are some useful links to help you organize your visit.